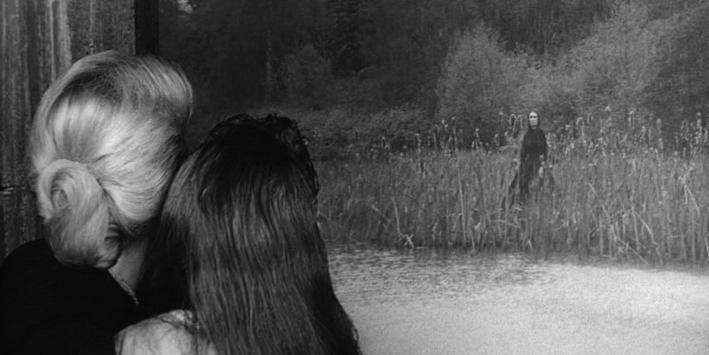 Is that really a ghost on the shore in Jack Clayton’s The Innocents, an adaptation of Henry James’s Turn of the Screw, or is it merely all in Miss Giddens’ head? There’s something about settling down in the dark of night to watch a well done creeper-feature, the kind that builds its atmosphere in layers like thick fog that keeps one guessing as to what’s really going on. As discussed here, much of a film’s success is dependent on the main character’s perspective on events unfolding with regards to how an audience is to interpret them. As such – and particularly in horror – the main character’s perspective is increasingly important when fostering suspense, an element that drives uncertainty, anxiety and indecision in a prolonged sense of “what happens next?”. But for that perspective to be effective and create the kind of suspense in the audience that will keep them on the edge of their seats, two approaches are most useful: creating cognitive dissonance and narrative blurring. [it’s] mental conflict that occurs when beliefs or assumptions are contradicted by new information. The concept was introduced by the psychologist Leon Festinger (1919–89) in the late 1950s. He and later researchers showed that, when confronted with challenging new information, most people seek to preserve their current understanding of the world by rejecting, explaining away, or avoiding the new information or by convincing themselves that no conflict really exists. Cognitive dissonance is nonetheless considered an explanation for attitude change. This entry was posted in Perspective, Story Structure and tagged Cognitive Dissonance, Dark Night of the Scarecrow, Narrative Blurring, Suspense, The Innocents, The Other. Bookmark the permalink. 3 Responses to Keeping your audience in suspense: cognitive dissonance, narrative blurring and the horror film.